by Kunz, Grace I.; Karpova, Elena; Garner, Myrna B. Going Global provides a coherent framework for understanding the textiles and apparel industry in the context of the sustainability of supply chain and global sourcing practices. The manufacturing and distribution of textiles and apparel products is a truly global industry, making it crucial that students are aware of the most current political, social and economic developments within the international marketplace. 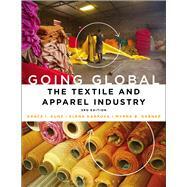 This third edition includes updated discussions of ethics, social justice, and environmental responsibility; trade agreements; and the role and specialization of the world regions and selected countries that are major players in the textile and apparel marketplace. The text examines Europe and the European Union, the Americas and the Caribbean Basin, the Middle East and Africa, and Asia and Oceania with an increased emphasis on China, Vietnam and Bangladesh. This current text will help students gain a holistic understand of supply chains and global sourcing concepts and practices. Introducing Going Global STUDIO--an online tool for more effective study! Teaching Resources: Instructor's Guide, Test Bank, and PowerPoint presentations available. PLEASE NOTE: Purchasing or renting this ISBN does not include access to the STUDIO resources that accompany this text. To receive free access to the STUDIO content with new copies of this book, please refer to the book + STUDIO access card bundle ISBN 9781501318344. Grace I. Kunz is an Associate Professor Emerita from the Department of Apparel, Events, and Hospitality Management at Iowa State University, US. Elena Karpova is an Associate Professor in the Department of Apparel, Events, and Hospitality management at Iowa State University, US. Myrna B. Garner is Professor Emeritus at Illinois State University, US.